New and alternative food processing methods &/or novel combinations of existing methods are continually being investigated by the industry in pursuit of producing better quality foods more economically. High pressure (HP) processing offers one such technique for pasteurization of foods or to modify their functional properties. The application of hydrostatic pressure to food results in the instantaneous and uniform transmission of the pressure throughout the product independent of the product volume. Other advantages include the lack of chemical additives and the operation at low or ambient temperatures so that the food is essentially fresh-like. High pressure is a physical treatment that will not cause extensive chemical changes in the food system. Once the desired pressure is reached, the pressure can be maintained without the need for further energy input. Liquid foods can be pumped to treatment pressures, held, and then decompressed aseptically for filling as with other aseptic processes. Commercial products have now been appearing in the US and Europe. Through CFI funding, we have established a unique HP processing pilot plant at McGill. 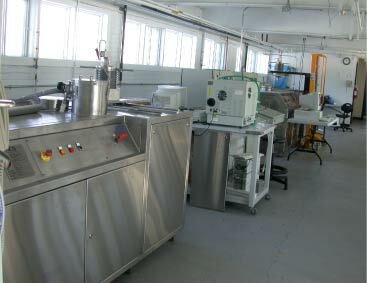 This new facility, features a high temperature high pressure 900 MPa unit for batch treatment and a dual batch/semi-continuous treatment for liquids, a 650 MPa HP unit for carrying out freezing and thawing studies, a multi-chamber HP unit for kinetic studies, a hydrodynamic pressure pulser for dynamic pressure applications, and many support equipment for quality evaluations: color, texture, rheology, calorimetry, microbiology eta. This is a unique set-up in the entire North America and will help to expand the horizon of HP research program. This $2.0 million facility is located in the newly renovated food research lab on Macdonald Campus Farm providing a show case of modern preservation technology. Facilities also include other novel heating technologies for food preservation: continuous microwave heating for solid and liquid products, microwave assisted osmotic drying, Ohmic heating and Radio Frequency heating. Together with other thermal processing equipment such as a rotary autoclave, plate freezer and state of the art temperature data gathering devices, facilities exist for carrying out novel thermal processing research.